Give Your Patients with Blue Cross Blue Shield the Convenience of Video Visits and Get Reimbursed for Them! It is almost certain that some day every patient under any insurance plan will have coverage for video visits that is in line with their in-person coverage. This is not the case yet, with laws and payer policies varying from state to state and plan to plan. There is good news for you and your patients with coverage through Blue Cross Blue Shield. Though BCBS operates as a separate entity in every state, they are on the cutting edge of telemedicine reimbursement. BCBS entities across the US are frequently reimbursing for these services when performed for patients on employer policies as well as Medicare Advantage plans. At present, thirty states have laws that require private payers to reimburse healthcare providers for visits performed with certain types of telemedicine technology. Like other payers, Blue Cross Blue Shield is subject to these requirements for most plans. (Some states allow small group plans to opt out of telemedicine coverage.) Many states require that telemedicine be reimbursed on par with in-person visits, while others leave the reimbursement amounts up to the payer. It is important to keep in mind that the Blue Cross and Blue Shield Association is a national federation of 36 independent and locally-operated Blue Cross and Blue Shield companies that collectively provide healthcare coverage for 107 million members – one-in-three Americans. Because each company is independently run, there is no one-size-fits-all approach to telemedicine within BCBS. However, the general trend has been a wholehearted welcome for telemedicine. Blue Cross Blue Shield, like many other large private payers, recognizes the potential cost savings and improved health outcomes that telemedicine can help achieve. For example, Independence Blue Cross which serves nearly 9 million people in 32 states and the District of Columbia, recently announced that they would offer coverage for telemedicine. So while coverage needs to be verified, there’s a good chance that your Blue Cross Blue Shield patients will be eligible for reimbursement, whether they are in a state that requires it or not. 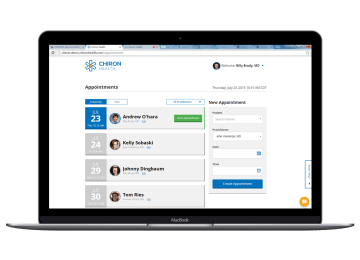 In order to make it easy for you to determine if your Blue Cross Blue Shield patients and others are eligible for telemedicine reimbursement, Chiron Health has developed the most sophisticated solution for eligibility verification. Our Chiron Health Rules Engine® is constantly updated by our experts with the latest information on telehealth coverage. When a video visit is scheduled, the Rules Engine receives the patient’s insurance coverage details and automatically determines whether the coverage includes telemedicine. We’re very proud of the Chiron Rules Engine®, but we also realize that great technology is not always enough, especially with the more complicated reimbursement scenarios that come up from time to time. That’s why we are staffed with a dedicated team of telehealth reimbursement experts who will work on your behalf to deal with the challenging cases. Your staff shouldn’t spend hours on the phone with BCBS resolving a billing issue. Because we’ve processed thousands of claims, we’ve probably seen something like it with another client and can help guide your team through the red tape. We’re so confident that our Rules Engine can make an accurate eligibility decision for Blue Cross Blue Shield patients and those with similar coverage, that we guarantee the accuracy of our verification. If a claim for a visit that we verify is ever denied, we will work with BCBS to resolve the issue. If we can’t, we’ll reimburse you for the visit ourselves. How can we be so confident? Because the The Chiron Rules Engine® and our team gets smarter with every eligibility check we perform. Blue Cross Blue Shield is a leader when it comes to improving patient outcomes while controlling costs by reimbursing for telemedicine. Yet plans do still vary, so it is prudent to choose a telemedicine solution that can easily validate coverage for your BCBS patients. There is significant upside potential for your practice and your patients so why wait?